Celebrating the life of Vernon Joseph Turnsplenty Sr.
Obituary for Vernon Joseph Turnsplenty Sr.
Vernon “Vernie” Joseph Turnsplenty, Sr. was born April 6, 1949 in Pryor, MT to Rose DeCrane - Turnsplenty and Ralph Turnsplenty, Sr. His Indian name is Aakeen-Taxxish (stray bullets flying overhead), given to him by Uncle Walter Grey Bull. He was a member of the Sore Lip Clan and child of the Big Lodge Clan. Vernie attended St. Charles Mission and graduated from Edgar High School in 1969. He excelled in football and basketball. Upon high school graduation he attended Northwest Community College and Haskell Indian Junior College. After obtaining his CDL he was employed in various driving positions. He was a bus driver for the schools in Pryor and drove truck for multiple construction companies. Vernie was a traditional man who participated in all activities. His favorite activities included hunting, fishing, camping and was an avid sweat hog. His mother Rose loved to camp. He would take her early for Crow Fair, always there to help set up camp with all her grandchildren. He would also take her to camp in the Pryor Mountains and would stay with her for weeks at a time. He participated in the Sun Dance and completed his 4-year commitment. He was a very caring man and loved all his children and grandchildren. In our culture this included all the children/grandchildren of all his siblings. He was adopted by his uncle Vincent Goes Ahead family and by Hannah Round Face family. He married Alice Iron but they later divorced. They had three children, Vernon “Joey” Jr. (Elizabeth Sperry), Teresa (Brett Hahn), and Peter (Hannah) and four granddaughters, Alyssia, Marie, Dakota and Arionne. He was married to Garnett Iron until her death in 2002. He married Rosalie Hunts The Arrow and they later separated. He was preceded in death by his parents; siblings Ralph Sr., David Sr., & Chester Sr. Turnsplenty, Marvella Dawes, Tommy DeCrane, Zelda DeCrane, Grant (Buckshot) Stewart, and Marvin (Cotton) Stewart Jr.; adopted daughters Rosina Turnsplenty and numerous family members. He leaves behind his siblings Sylvia Gone, Priscilla Nez Perce, Charlene Laverdure, Wayne, Louise, Verna, Mary, Avalon, & A.J (Adora) Turnsplenty, Faith (Dave) Wounded Face, Calvin (Beth) Brush, and Charles Robinson; adopted daughters Bernice Pellman, Valerie & Renita Turnsplenty, and Belle Laverdure; aunts Agnes Pretty Weasel, Rosalie Turnsback and Regina Goes Ahead; his longtime friends Ronnie Beaumont, Jerome Hugs and Vidal Not Afraid. 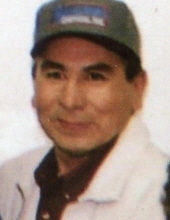 His extended families include DeCrane, Goes Ahead, Whiteman, Gloria Cummins family, Clara Bend’s family, Bad Bear, Hill, Wall, Deanna & Larson Medicine Horse family. Our family is large, we apologize if we have forgotten anyone in our time of grief. To send flowers or a remembrance gift to the family of Vernon Joseph Turnsplenty Sr., please visit our Tribute Store. "Email Address" would like to share the life celebration of Vernon Joseph Turnsplenty Sr.. Click on the "link" to go to share a favorite memory or leave a condolence message for the family.